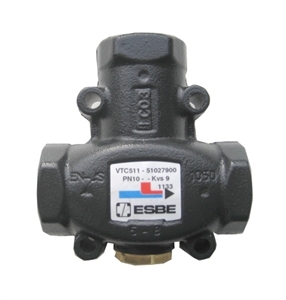 The ESBE VTC thermic valve is a thermostatic by-pass valve which regulates the temperature of either the supply out or the return of water in a hydronic heating system. 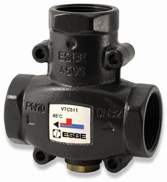 In a conventional application, the VTC valve safeguards non-condensing boilers against corrosion from condensation that would result if a minimum flue gas temperature is not maintained. With the VTC, the boiler is able to recover and keep up with the drop in water temperature. The VTC valve can also be used on a solid fuel boiler or a solar application where a minimum or maximum water temperature is trying to be maintained.